Place passion fruit pulp in a sieve, drain remove the seeds and retain the juice. Cut mango into small chunks and roughly mash with a fork. 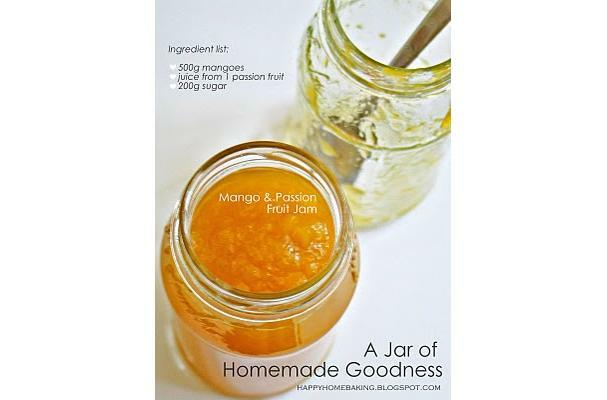 Place mashed mangoes, passion fruit juice and sugar in a stainless steel pot or a large saucepan. Mix well. (Note: use non-reactive pots made with stainless steel, glass or enamel, avoid pots made with copper, aluminum or cast iron which would react with acid). On medium heat, stirring constantly with a heat-proof spatula or a wooden spoon, bring the mixture to a full rolling boil (when the bubbles do not stop or lessen when you stir it). Once the mixture starts to boil, skim away any excessive foams or bubbles, stirring constantly all the time. Keep at a slow rolling boil for another 5 ~ 10 mins, stirring constantly till the mixture thickens, becomes clearer and transparent (no more foams). Ladle hot jam into hot sterilised jars, fill to the brim. Secure lids. Let cool. Unopened jam will keep up to 3 months** if stored in fridge or in a cool, dark cupboard. Once opened, store in fridge and best consumed within 3 weeks. How to sterilise glass jars and bottles: Wash glass jars and lids in hot, soapy water, rinse well. Place jars and lids in a pot. Fill with enough cold water to cover the jars. Place over high heat and bring water to the boil. Reduce heat to medium and boil gently for 10 minutes. Remove jars and lids from boiling water and drain upside down over a clean tea towel. Preheat oven to 110 degC. Place jars and lids upside down on a baking tray. Place in the oven and heat for 15 minutes. Proceed to make the jam while the jars are in the oven. Do use glass jars with lids that come with a gum binder that seals them against the top of the jar.